Won't you join me for either some angel biscuits or date and nut bread today for tea time? I have to admit that date and nut bread is probably my all-time favorite quick bread, and I've been making the same recipe since I was in high school. You can find that recipe here. This darling coaster came from my friend Stephanie at Enchanting Rose. Isn't it the cutest thing? Stephanie is so talented and she recently shared the tutorial on her blog on how to make them. This darling teapot was sent to me from my sister. Don't you love the detail on this strawberry design? The sweet angel was given to me from my daughter for my birthday. Isn't she perfect for residing over the angel biscuits? The teacup is Strawberry Fair from Johnson Brothers. I do love red transferware! 1) Whisk together the flour, yeast, sugar, salt, and baking powder. 2) Add the shortening, mixing till evenly crumbly. 3) Add the butter, mixing till roughly combined. Pea-sized bits of butter can remain. 4) Add the milk, mixing till just combined. The dough will be quite wet. 5) Transfer the dough to a well-floured work surface, and quickly and gently pat it into a 7" diameter, 1"-thick circle. 6) Use a 2" round biscuit cutter to cut 16 biscuits. (My cutter is bigger, therefore, I didn't get as many biscuits). Place them close together on a lightly floured or parchment-lined tray or baking sheet. Cover with lightly greased plastic wrap or the cover of your choice, and allow the biscuits to rest at room temperature for 1 hour. 7) After an hour, cover the biscuits with plastic wrap, and place the pan in the freezer for at least 1 hour. Overnight is fine. Alternatively, biscuits can be frozen up to 2 months. 8) When ready to bake, preheat the oven to 400°F. 9) Remove the biscuits form the freezer, remove the plastic, and space them on a lightly greased or parchment-lined baking sheet. 10) Bake the biscuits for 16 to 18 minutes, till they're golden brown. 11) Remove from the oven, and brush with melted butter, if desired. Oh YUM! Thank you, Kitty, for the wonderfully delicious looking and sounding treats for tea time! Your little mug rug coaster is adorable- how sweet of Stephanie! As for your birthday angel, ohhhhh I love it - along with your fabulous pillows. My how perfect they'd look on MY sofa, tee hee. The tea pot from your sister is so beautiful! The detail on it is truly remarkable. Thank you for the tasty recipe - you know I love your recipes :) Love and hugs to you! This is another keeper recipe, Kitty. You always share the most delicious tea time treats. I never saw a strawberry tea pot. It is so cute. Love the angel. Hi Kitty, what a beautiful tea you have and I bet everything is delicious. Thanks for sharing the biscuit recipe. I love your teapot! And who can't love red transferware! The coaster is daring! The biscuits look wonderful! Thanks for the recipe and for linking to Tuesday Cuppa Tea! What a cute teapot, Kitty, and you know I am loving your teacup! The coaster is really cute and those biscuits, oh my, they look so good! I love a fresh biscuit with tea. Thanks for sharing the recipe and your pretty post with us. It's always lovely to have you join me for tea, my friend. What a lovely tea Kitty! The angel biscuits look so light, and I do love date nut bread. Love the JB Strawberry Fair. And how sweet of Stephanie, she made the coaster in the perfect print for you! And I love the pillow with the button heart in the background, very cute. Well done on the teacup coaster! The teapot and red transferware cup and saucer are the perfect match! These look and sound lovely. Can you clarify how much shortening to use. Thanks. Thank you so much for noticing that I left out the shortening and the amount, Debbie. I so appreciate it and have corrected the recipe. Is there a particular flour? all purpose or self-rising? Everything looked so delightful and such lovely gifts! You are blessed indeed! May have to try the bisquit recipe! Thank you for sharing. Good morning, dearest friend! Thank you so much for sharing this lovely post at Roses of Inspiration - I always appreciate you linking up. Have a blessed Tuesday! Hugs! It is breakfast time right now and do those biscuits ever look divine! I could go for one of those with a nice cup of tea, especially in one of the lovely tea cups you have blessed me with. I like the idea of freezing these little dainties. I will give it a try so I will have them on hand for company. I'm at the air port right now, flying out to be with my parents for another couple of weeks. Have a beautiful blessed day my friend. Kitty: What a great recipe you shared. I like King Arthur flour too. I always appreciate all your recipes and baking you share. Your cup and saucer are darling. I saw a plate in that pattern last Sunday but it was too pricey but I did read the name and it was like your cup and saucer. So glad you shared at Friends Sharing Tea. Have a great week! 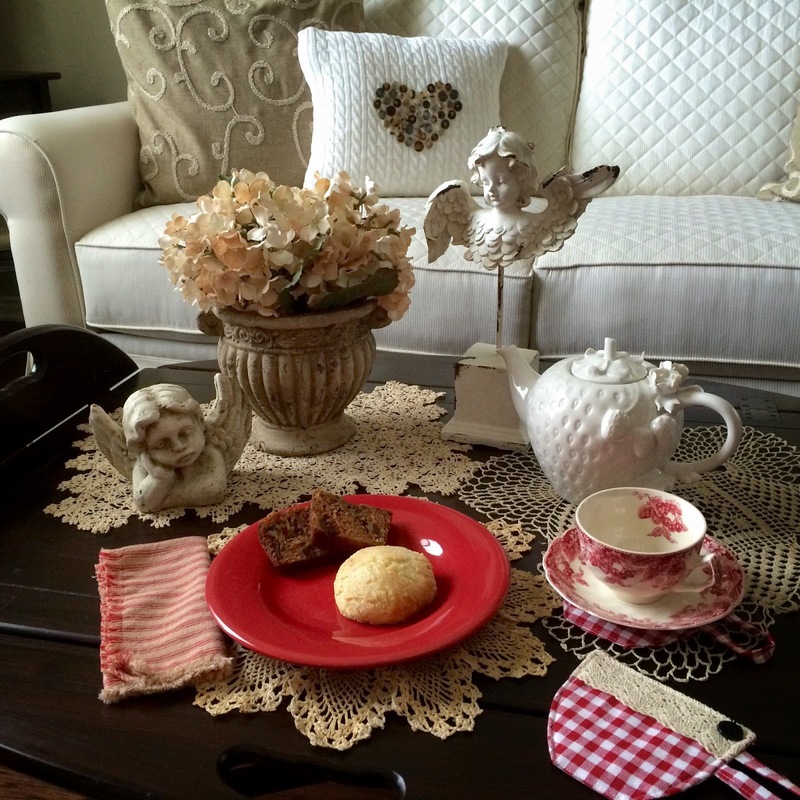 I love that adorable coaster and the angel and the tea pot and the red transferware....I jut love it all, Kitty.. I like the strawberry teapot you're using this week Kitty, and the teacup coaster is sweet. When baking in Florida I found the flour to be different than ours, maybe ours is pre-sifted. These biscuits do sound yummy, thanks for sharing your recipe. Lovely tea pot! Oh my! I am swooning over the strawberry cup! Hi Kitty! 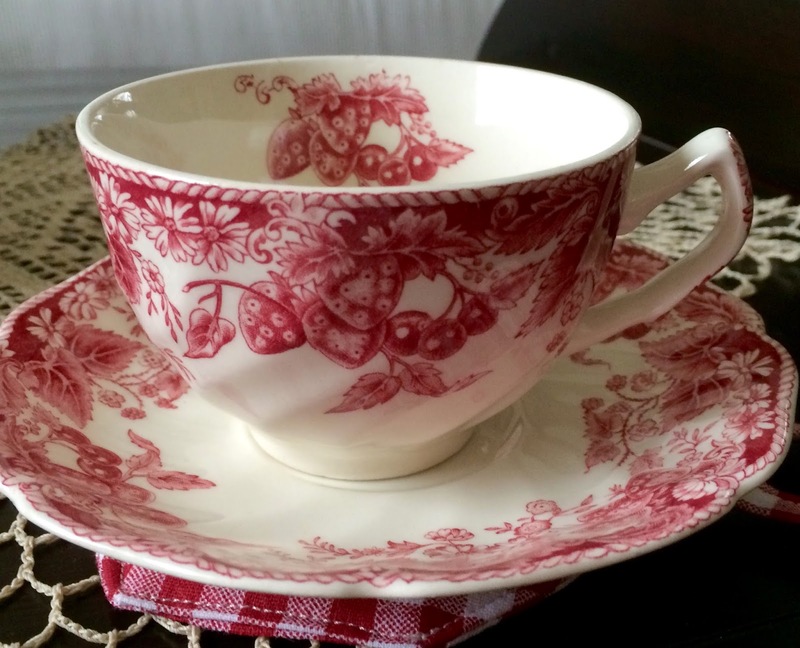 That pretty strawberry teapot is a perfect match to the red transferware teacup! 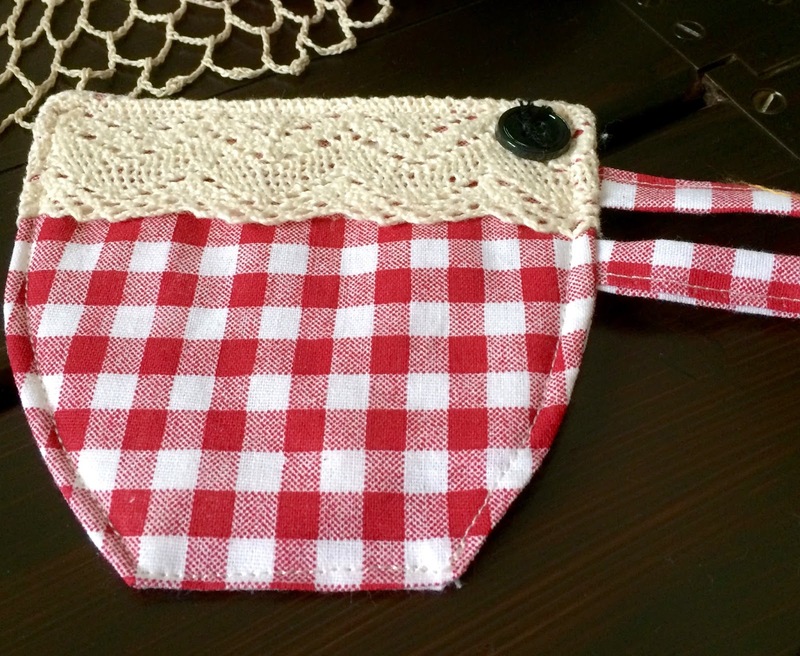 I've never seen that red transferware pattern--so pretty! I really like the teacup/mug coaster, very cute. Your tea vignette is really pretty. Love the teapot and teacup and your biscuits look good! Have a good week, Kitty. I recognized your tea cup coaster right away...so darling. I made these biscuits once and need to again. They were very yummy. Kitty, I love your red china and those angel biscuits do look angelic. I could eat a dozen, so maybe I shouldn't make them! I love your cup and saucer. So pretty. And isn't that Stephanie the best! Hi Kitty, I love the closeup picture at the end of your post; it looks like I could reach out and take a bite of that biscuit! It looks sooo good!! 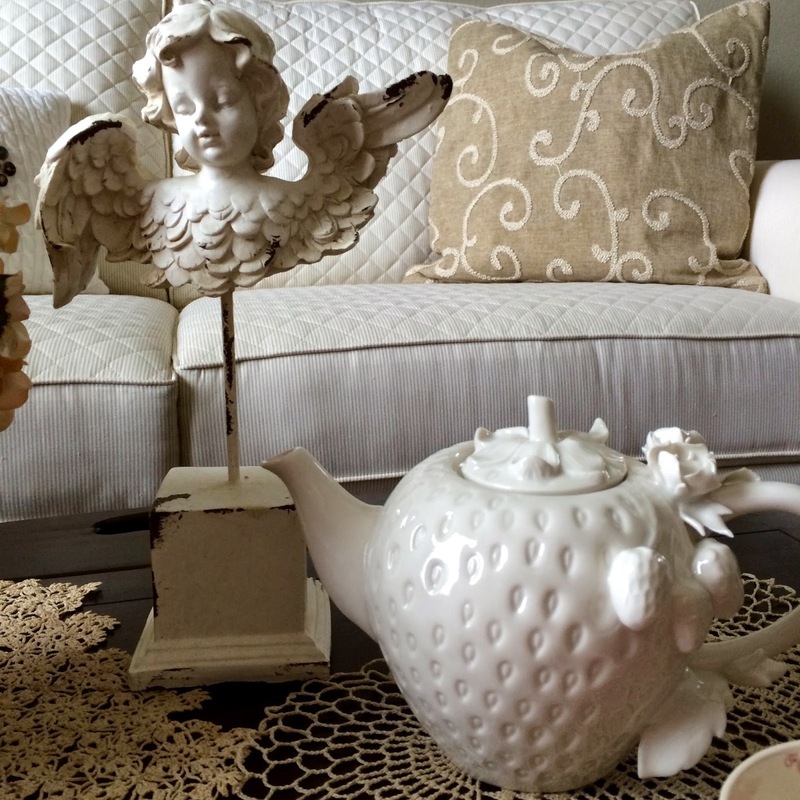 I love your red and white checked coaster, and your teapot and angel are beautiful, too. I, too, love red transferware, and your strawberry cup and saucer are lovely. 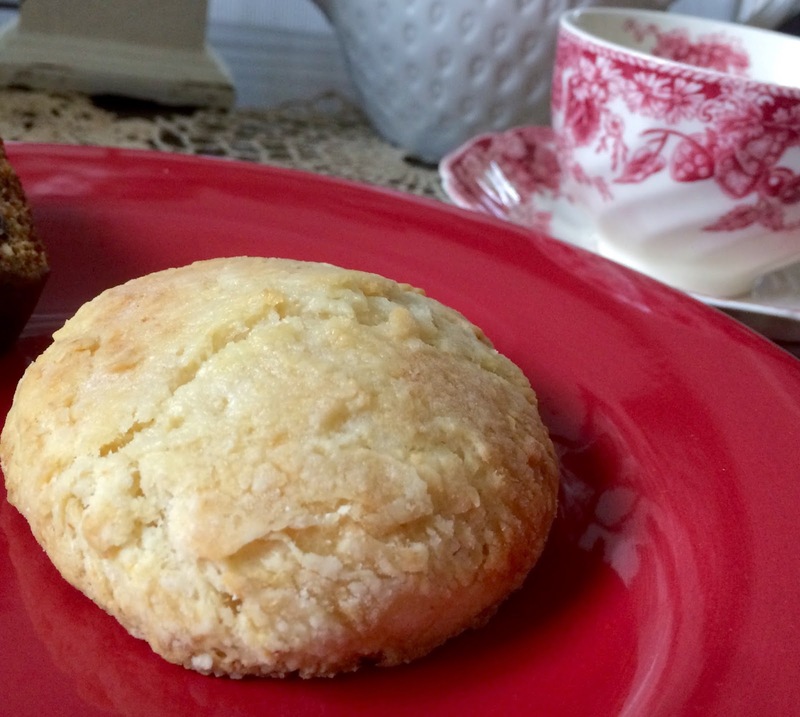 I made angel biscuits early in our marriage, and I do remember how tasty they were. I'm pinning your recipe because it looks better (and easier) than the one I used. :) Thanks for sharing this with us and have a wonderful weekend! Oh my Kitty, those biscuits do look angelic. I can't wait to try them! I love your Johnson Bros. teacup. I have never seen this strawberry Fair design. So sweet! the cozy from Stephanie is simply darling and I love your other sweet gifts. Thanks for sharing with SYC. Can't wait to see your granddaughter tea next week! Everything looks so pretty! I love it all. The red transfer ware calls my name. :) I'd love to have either of your delicacies. Will copy the biscuit recipe. I have completely forgotten about the date nut bread ~ one of my favorites. I appreciate the reminder! I would like to ask a favor....would you please let me know if this post shows up in your email? I understand that Google won't allow aol or yahoo anymore. I created a gmail account so trying to see if anything changes. So very frustrating! Hope you're doing well. You're always in my prayers my friend. I like the texture of the biscuit/rolls. I could probably eat a few dozen. :-) Love your white sofa and the pillows. So pretty! I would love to have your biscuits and a cup of your wonderful tea right now. We are having a rainy day again, so that would be real cozy. We are grateful to have the rain, our lake is starting to fill up again,wa hoo! Your tea tables always look so pretty, I love your angel, I have one just like it. Thanks so much for sharing this awesome post with Full Plate Thursday. Hope you have a fantastic weekend and come back soon! These angel biscuits sound divine! Who wouldn't love a biscuit roll combo? Pinned to try asap, thanks Kitty! I was so busy drooling over the angel biscuits I forgot to mention how delightful your vignette is, love the angel! I saw these biscuits featured at Weekend Potluck! They look so tempting, gotta try this recipe!